Re: OMG, IT'S SO CUUUUUUUUTTTTTEEEEEEE!!!!! Just so everyone knows what I've been cooing over since Thursday, prepare yourself. It's been called a cross between a kitten and a teddy bear in looks. Need proof of it's cuteness? We have the TVs here on CNN all day (I still haven't been able to figure that one out... *shifts eyes*), and when it popped up Thursday, I would just exclaim "omg, it's so cute!" in that high-pitched annoying voice that everyone hates. 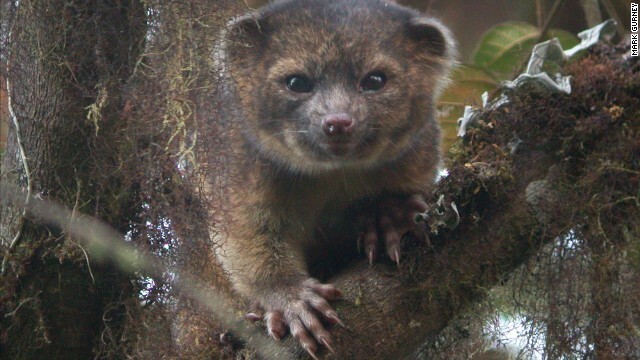 And, those people at CNN can't just drop something and they would re-air it multiple times between Thursday and Friday, and everytime I would exclaim either "D'AAWWW" or "It's just oh so cute, I want one to just pet and make purr or whatever olinguitos do when they're all content and happy." (side note, I love scratching under my cats's chin so that they smile like the Cheshire Cat... Or that one spot on my dog that makes him smile and kick his leg). Me, being the crazy person I am, actually had the CNN Article open in my web browser. And, since I'm notorious for not closing browser tabs, I'll go research something, and when I close that the article appears and I'll exclaim "Aawww!!!" (I'm surprised I haven't been told to close that page yet with the number of random "Aawww!!! "s that have come from my cube. (Cuteness Factor ) is now over. You have proven it's Cute. That is adorable, but i can only imagine how CUTE those teeth may be. I want one! Uhm... That wasn't cute... That was actually quite horrifying. That thing looks like it can go from docile to deadly in two seconds flat.